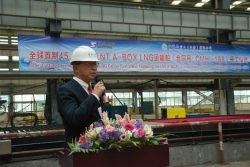 China Merchants Heavy Industry’s Jiangsu shipyard held a steel cutting ceremony this past Sunday to commemorate the start of construction of an ABS-classed LNG carrier with 45,000 cubic meters of storage capacity. The bespoke carrier is the first of two such vessels ordered in late 2015 by David Wu’s Saga LNG Shipping aimed at bringing new life to the dwindling midsized LNGC fleet. The vessel, hull numbered CMHI-188, will be the first LNGC to feature an IMO Type A LNG containment system developed by Norway’s LNG New Technologies (LNT). LNT’s novel containment system for LNG and other liquefied gasses, dubbed the “LNT A-BOX®“, features an IMO independent tank type A as the primary barrier, a conventional cargo tank support system and liquid-tight thermal insulation attached to the hull compartment which acts as a full secondary barrier. Based around the LNT A-BOX®technology, Saga LNG shipping aims to build, own and operate a series of tailor-made small and midsized LNG assets targeted at projects currently in various stages of development. Types of assets included in Saga LNG’s scope are FSUs, LNG Barges & LNGCs, FSRUs, FLNGs, and LNG Bunker Vessels, all within the 1,000 to 100,000 cubic meter range.